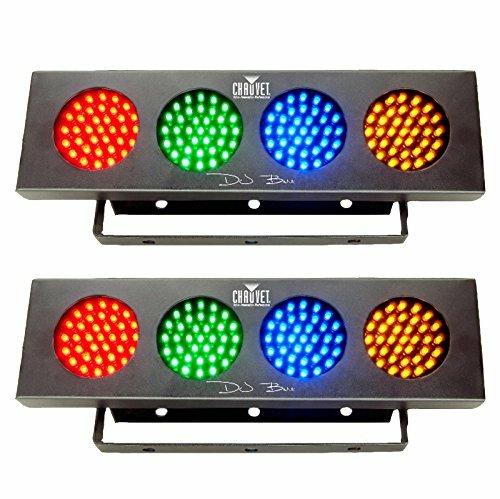 Illuminate your special event with this 2-pack of Chauvet DJ Bank Wash Effect LED Light Strips. Ready to shine right out of the box, these units quickly and easily add vibrant colors and good vibes to any gig. They are lightweight, heat-free fixtures that include 4 pods of flashy red, green, blue, and amber LED lights. The lights chase to the beat of your music with the sound-activated programs and the all-on switch allows you to turn on all 4 pods to wash the room. These DJ Bank units are lightweight and compact that make them easy to transport and can be linked to multiple units. Give your party, wedding, or concert a colorful glow that will make your guests and crowd weak at the knees with these Chauvet DJ Bank Wash Effect Light Strips.